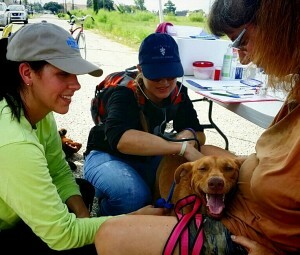 Volunteers, Brooke and Dr. Christi Johnson, examine Jill and speak with her owner, Linda, about her health and needs. Many people live on the streets and in the woods, are down on their luck, out of work, or struggling along with their beloved pets. We provide the basic care for their pets – spay and neuter, food, flea and tick treatment, heartworm preventatives, basic medical support and tests for heartworms. We provide care and medicine with licensed Veterinarians in a clinical setting, so our community in need can continue to love their pets and feel comfortable that their needs are met, too. Our clients include Veterans, families in crisis, people who have lost their jobs, the homeless, and the elderly. At this time, our funding does not allow us to provide emergency care for pets. Please check out our Facebook page for photos of the people and pets in our program! 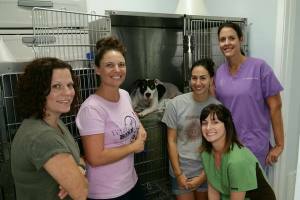 Miss Raven was spayed during a Spay/Neuter Day for our clients in the homeless camps. She also had an umbilical hernia repaired. Spaying and neutering saves lives. In our community, there are animals sitting in shelters waiting for homes. Unfortunately, only a small portion of those dogs and cats will ever get one. Many will be euthanized. We aim to help reduce shelter intake and euthanasia by providing education and free spay and neuter services to people living who are homeless or live below the poverty line.